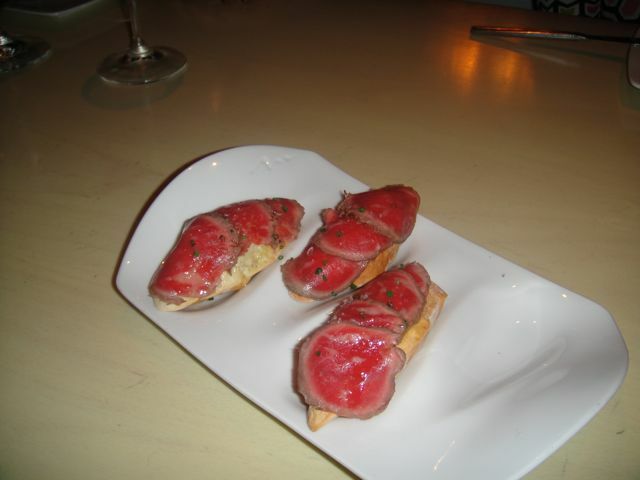 Hard to believe that it has been almost five years since we have eaten at Jose Andres’ Bazaar. 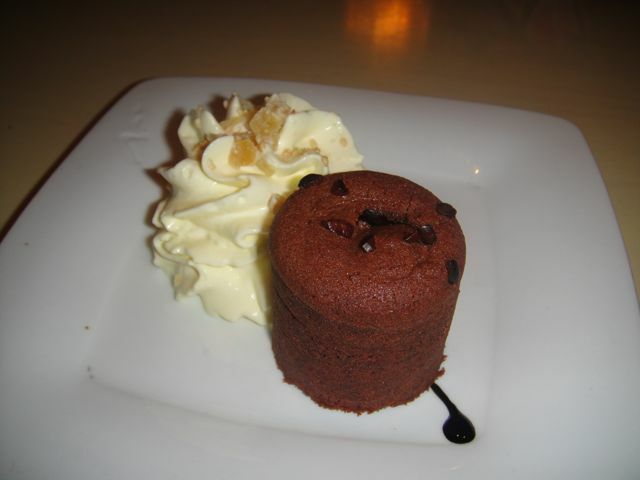 We tend to order our favorites as we know the kitchen will do them right. 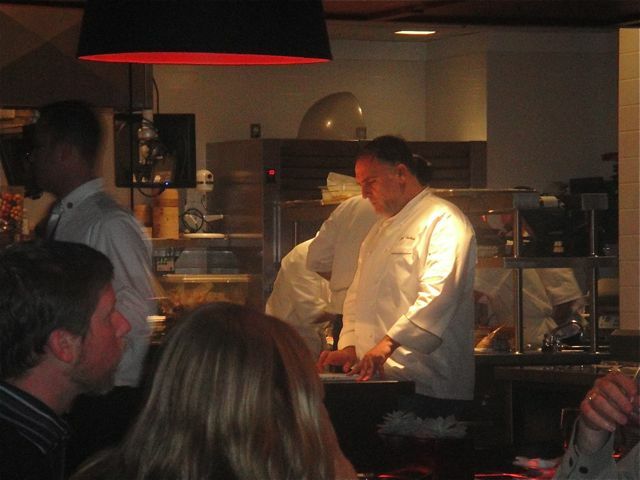 Jose Andres doesn’t have to be there to deliver a great meal – he has trained his kitchen staff to be extraordinary. This is not a restaurant that is an outpost restaurant with an absent chef – this is a well-oiled “machine” that delivers excellent well-executed food. 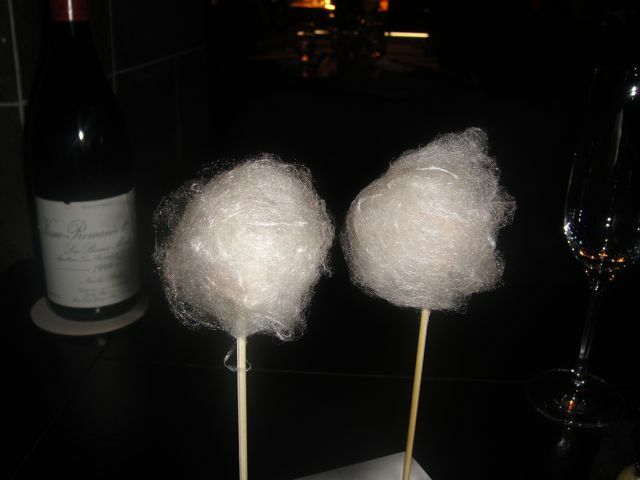 Cotton Candy Foie Gras – the cold foie gras terrine is rolled in corn nuts then encased in the sweet cotton candy – thank goodness foie gras is back in California – a wonderful beginning. 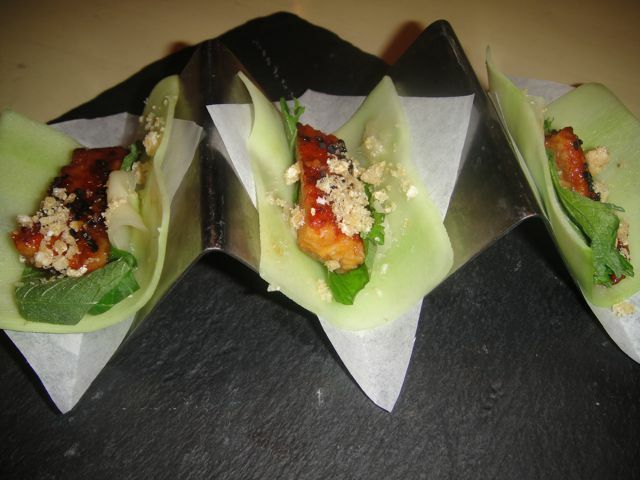 Japanese taco – BBQ eel, shiso leaf, cucumber, wasabi, chicharron – The cucumber functioned as the wrapper and the eel was sushi bar spectacular. 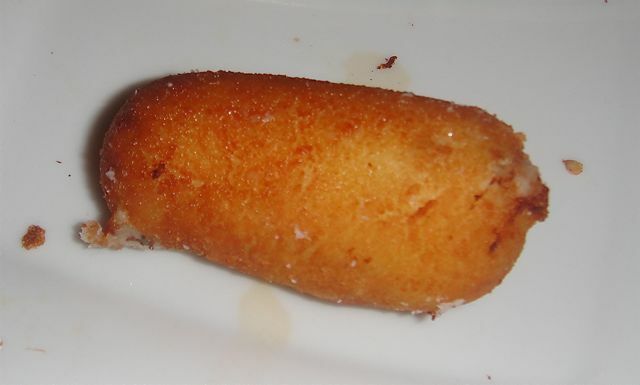 The chicharron (the skin of the pork) were deep fried and served as the crunchy topping for the eel. 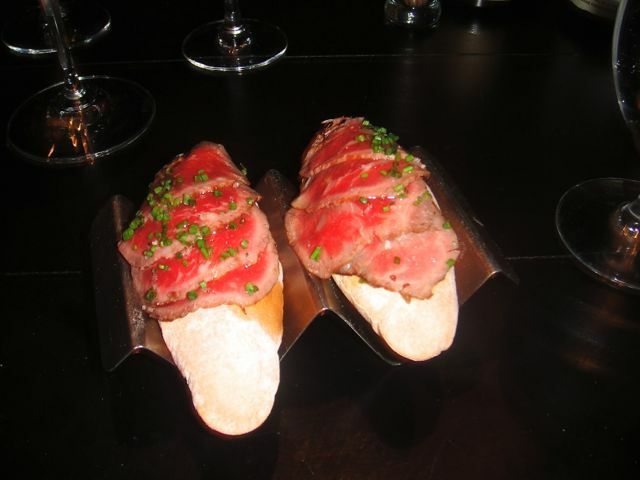 “Philly Cheesesteak”- air bread filled with oozing cheddar cheese and topped with Wagyu Beef – I just love this dish and make it a point to order it every single time. 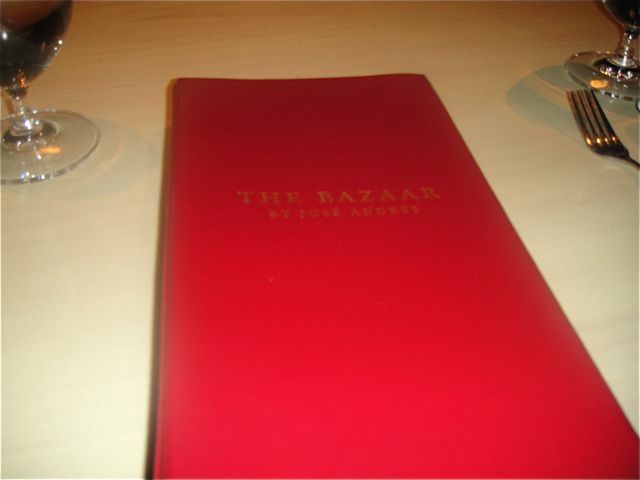 Bazaar has become one of our favorite restaurants. 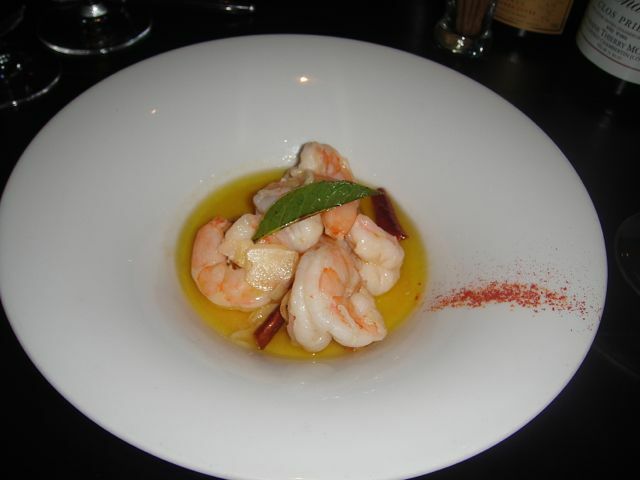 The food and service is exceptional. A word of advice, though, do go early for there is little or no scene and people are there to dine. 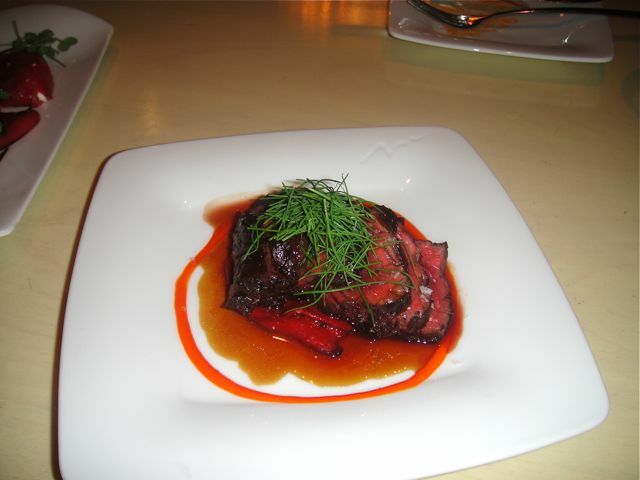 You can order one dish at a time and create an incredible tasting menu. One other advantage of going early, you can actually carry on a conversation with your dining companions. 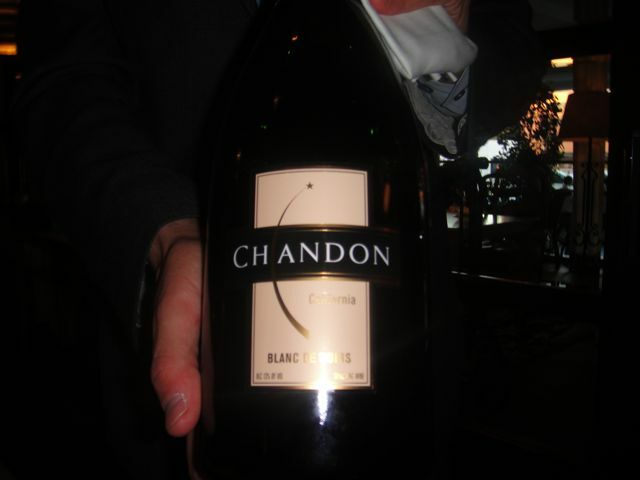 Aaron Sherman handled the wine with class. I should have expected that as he is Paul Sherman’s son. 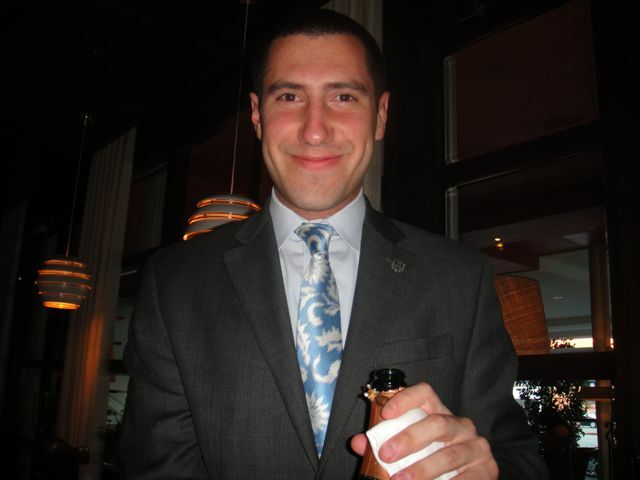 We have known Paul Sherman for over 25 years and I might add son takes after his father. 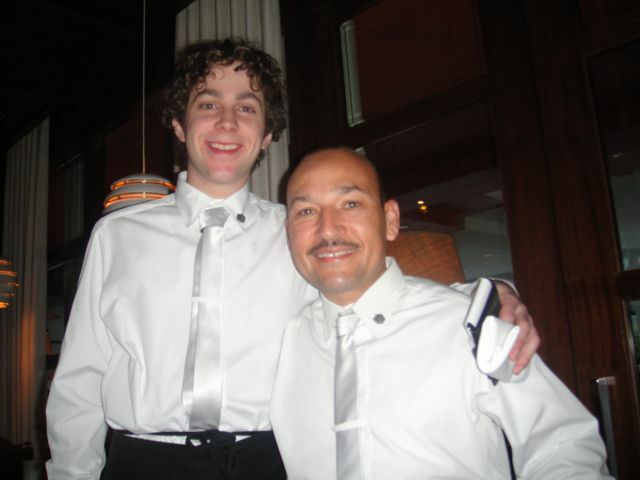 Paul was the manager at Michael’s starting in 1985 and is now sommelier at Valentino. All notes were lost somewhere on the table or getting to the car or who knows where. As a result, my descriptions rely heavily on what is on the menu. Also, one member of our party of four couldn’t have gluten, but I must say Alex handled this not as a problem, but as a way to introduce us to dishes we might not have ordered. 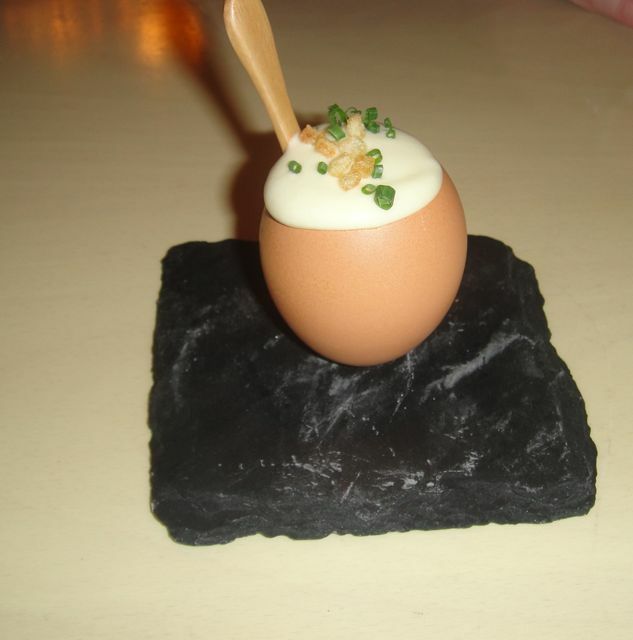 Tortilla de Patatas “New Way” – warm potato foam, caramelized onion with a slow cooked egg 63 and topped with chives and crispy small dice of croutons – this was done with a quail egg which is far superior to a regular egg as the yolk remains runny and the white congeals nicely. 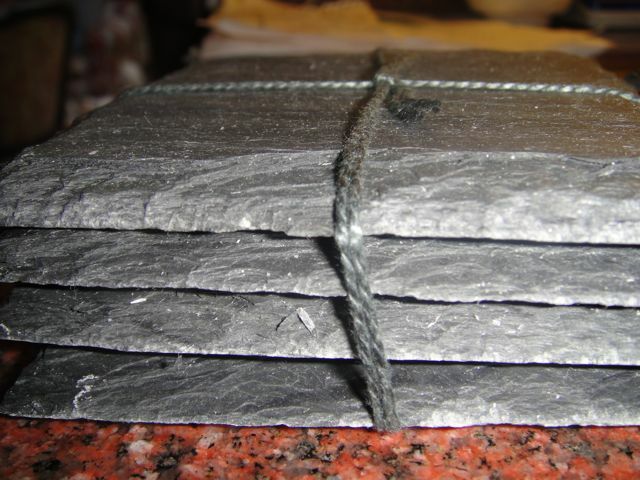 I do love the slate presentation and I am stealing this idea! 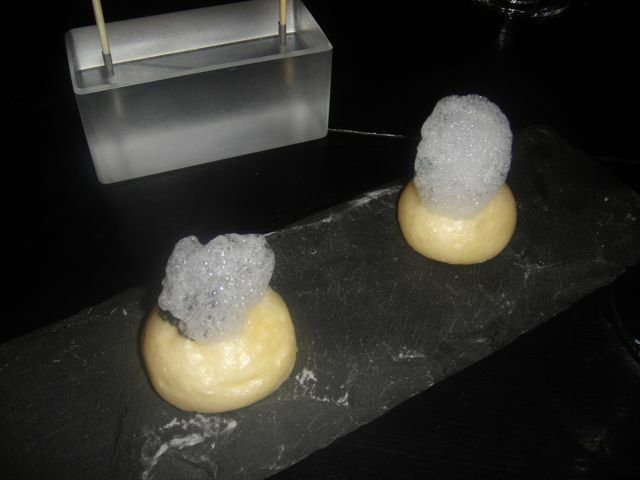 Cotton Candy Foie Gras – absolutely spectacular – eat this in one bite and the cold foie gras terrine rolled in corn nuts with the sweet cotton candy is a marriage made in heaven. 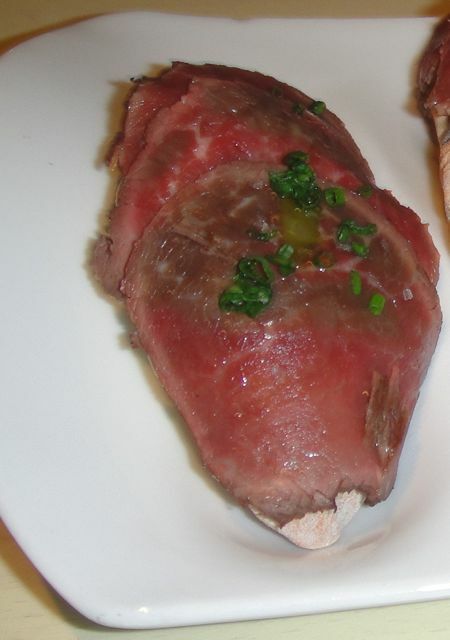 Acorn-fed, free-range Ibérico ham —- Jamon Iberica de Bellota Fermin – – this ham is extraordinary and worth the extravagance – much better when shared by 4. 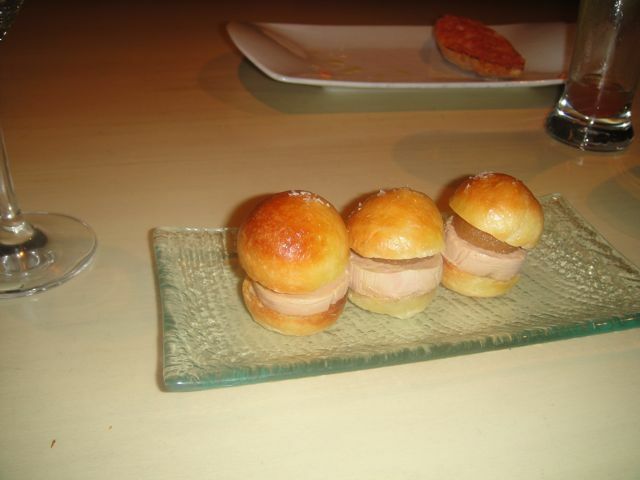 It is served with Catalan style toasted La Brea baguette with tomato – you are suppose to eat the ham separately from the bread; a custom my husband ignores. 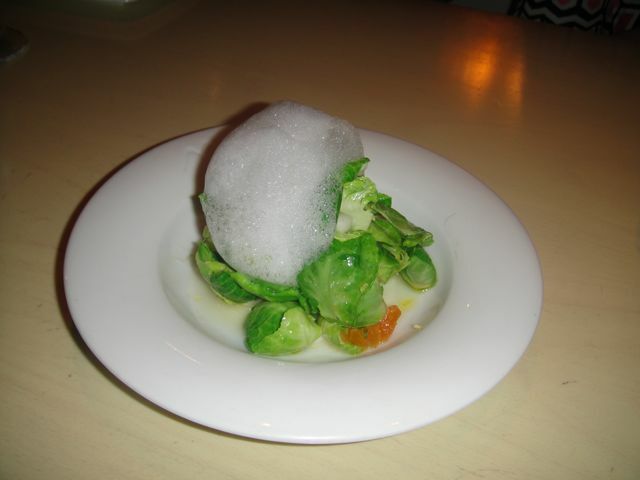 Brussel Sprouts – Lemon purée, apricots, grapes, lemon air – never in a million years would I have ordered this dish, but this was an add-on for our gluten-free friend. Perfect. 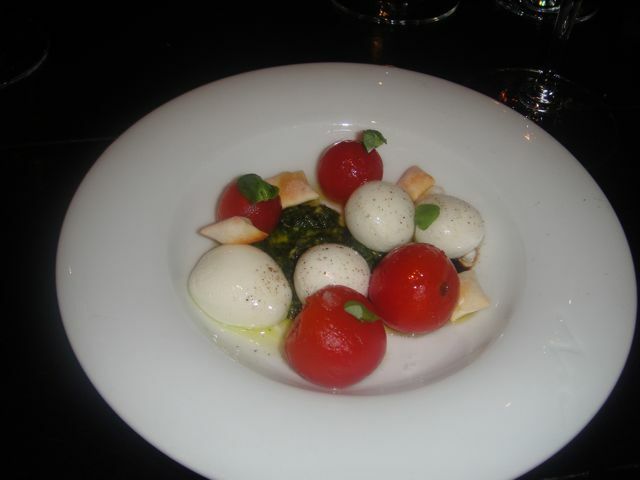 The Bottom line – go for the food, not the scene. Go early. Don’t treat this as a Chinese restaurant and order 5 dishes at a time. 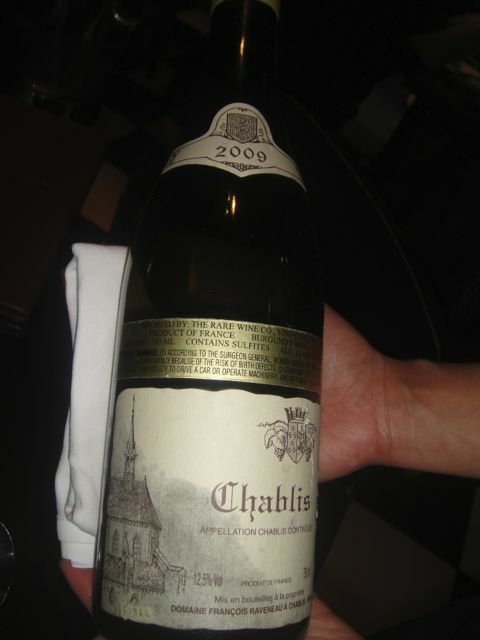 The servers are knowledgeable and more than willing to help you compose a leisurely “tasting” menu. Just go. 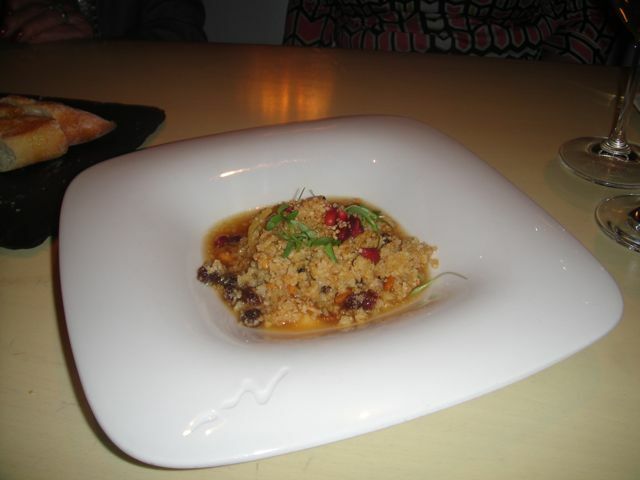 I know the restaurant is trendy, somewhat loud, but the bottom line for us is the food and for us, Bazaar delivers. We were also lucky to have a wonderful server – Josua took our orders promptly (other than the first two dishes, we ordered one dish at a time so that was no easy feat) and anticipated our every single need. 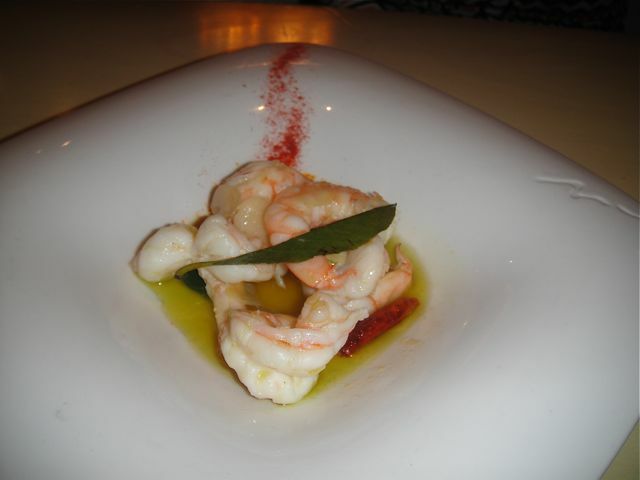 What more can one ask for – good service and good food? 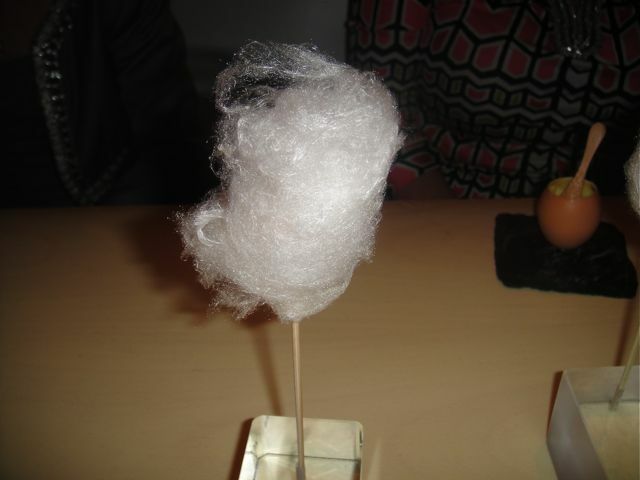 Cotton Candy Foie Gras – foie gras terrine was rolled in corn nuts and then wrapped” in vanilla cotton candy – I love this dish and it is not just for show. 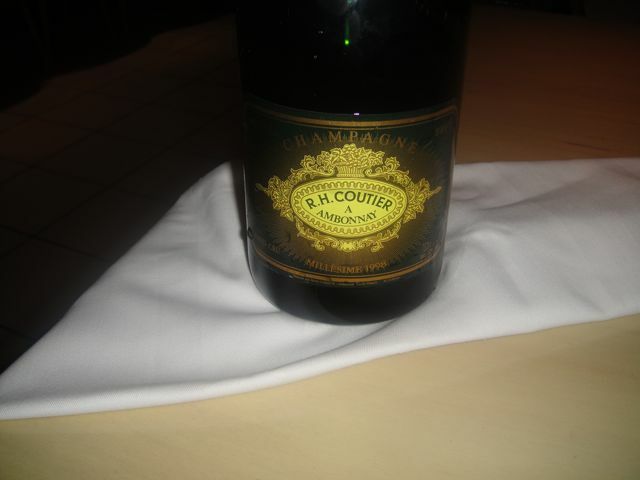 It is a wondrous taste of contrasts – crunchy corn nuts, smooth silk luxurious foie wrapped in a veil of sweetness. Jamon Iberico de bellota Fermin – acorn-fed, free-range Iberico ham – Absolutely had to have this again and just as delicious as the first time. 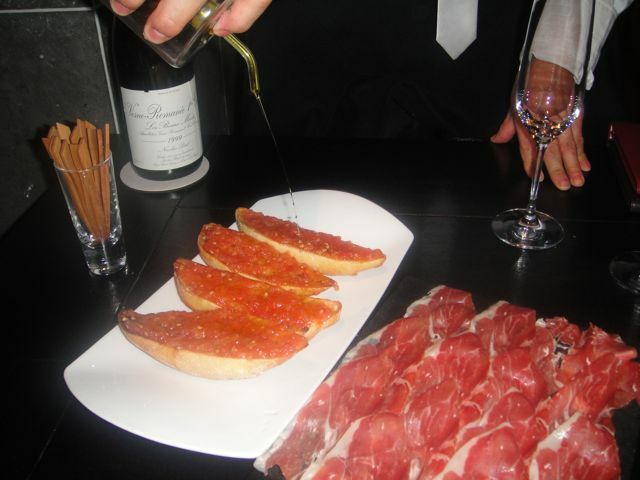 The jamon is served with Catalan style toasted La Brea baguette with tomato; eat the jamon and bread with tomato separately. 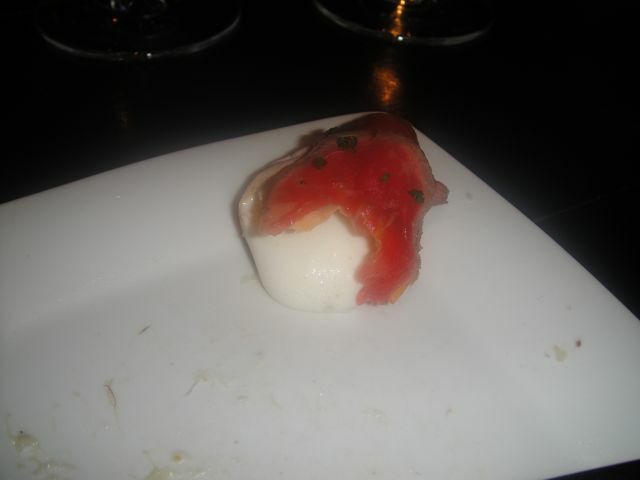 The bread with tomato was perfect as well as the jamon. In retrospect, I would not order this for two people as it is a lot of food and you fill up too much. 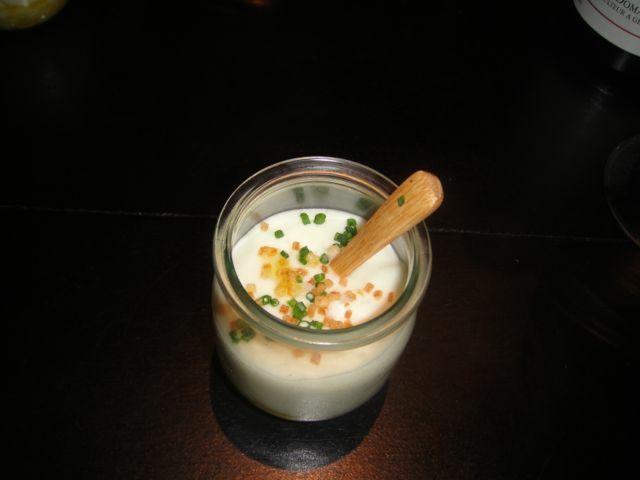 Tortilla de Patatas “New Way” – warm potato foam, caramelized onion with a slow cooked egg 63 and topped with chives and crispy small dice of croutons – this was the only miss of the evening – the white just doesn’t coagulate enough so you end up eating runny white. Jose Andres is not an absentee owner/chef. He checks in with Bazaar often and was in the house last night. 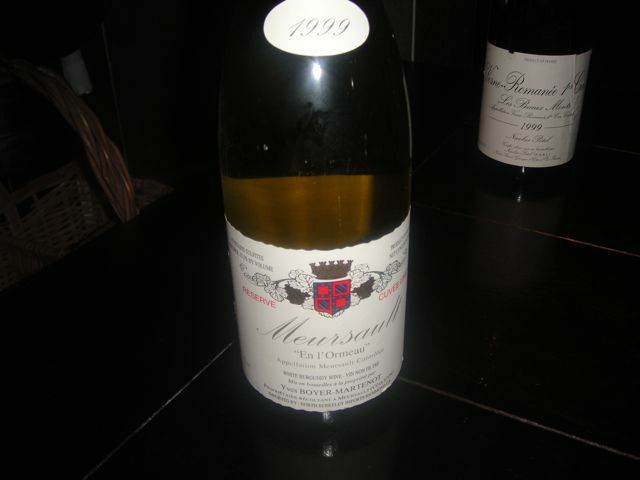 I “know” Jose from DC and he attended Michel Richard’s birthday party as we did. 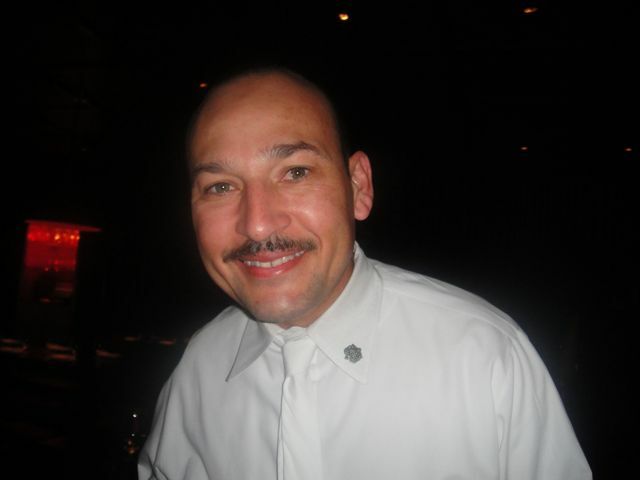 I briefly talked with Chef Andres and put in my plea to have the eggs Andy Garcia from the brunch menu put on the dinner menu. He thought it might be a good idea. Yippee! It is with great sadness that I have to report that Bazaar will no longer be serving brunch on Saturday and Sunday after Feb 13. 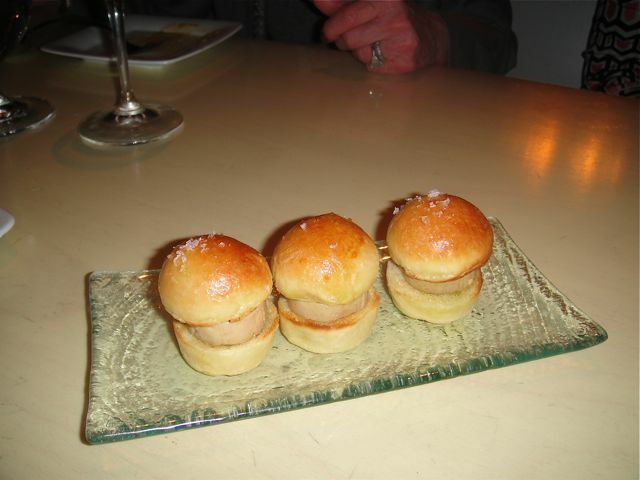 I love Bazaar’s brunch – it is not a scene and the food is delicious. 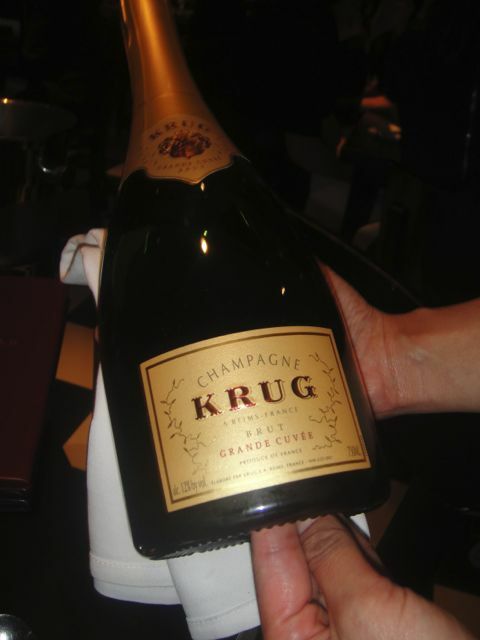 The menu – very extensive, even at brunch. 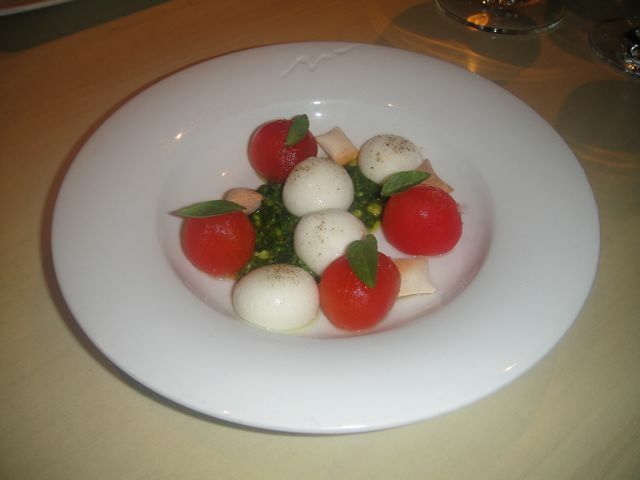 Unfortunately the egg dishes are not on the dinner menu. 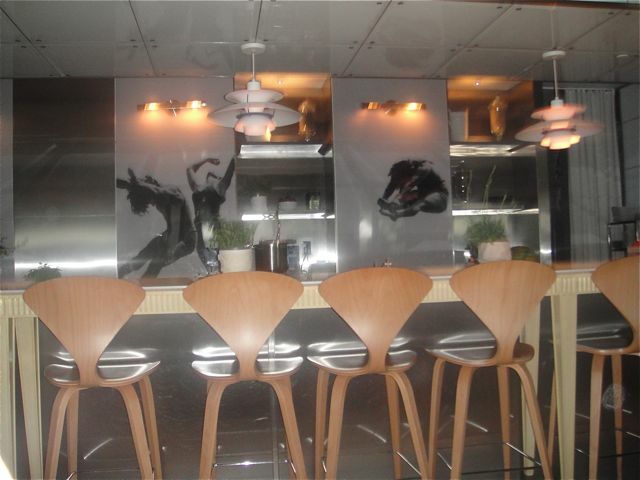 The bar area – also prep is done in this area as well. 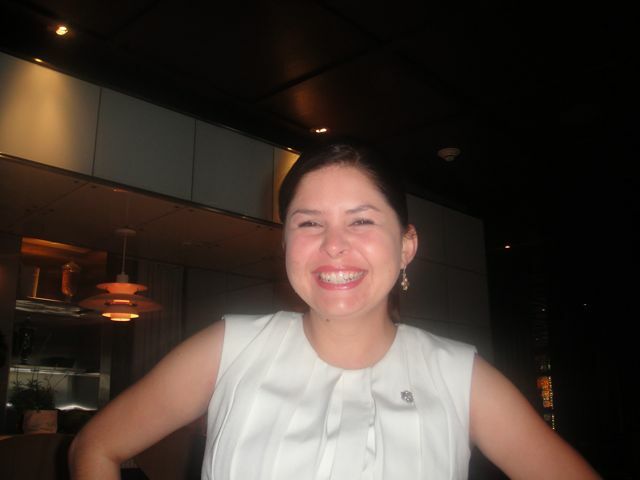 Nicole – our cute server who also has a French Bull dog, Camilla, who seems to be as spoiled as our 3 dogs. 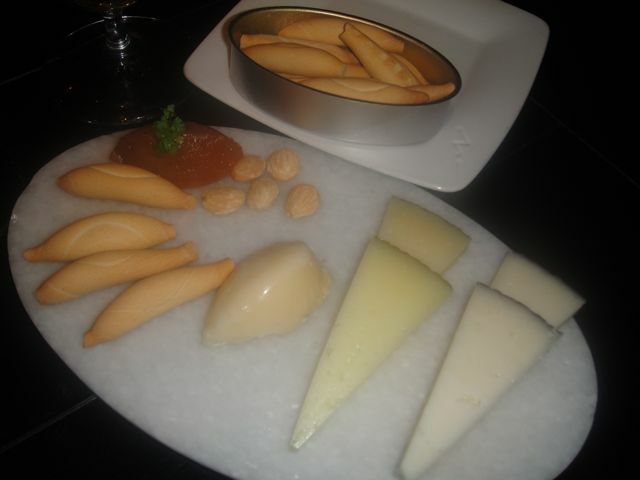 We tend to order the same things again and again so many of the descriptions are repeats as the dishes themselves. Bloody Mary – “Freshly-made tomato juice, celery-wasabi foam” – The base is a mix of tomato juice, vodka, Worcestershire, lime juice, salt and pepper. It is topped with celery-wasabi foam that is created by loading wasabi-infused lime juice and celery puree into a CO2 canister. Nicole suggested that we choose Ketel One Vodka as it is the purest. We did as we were told. 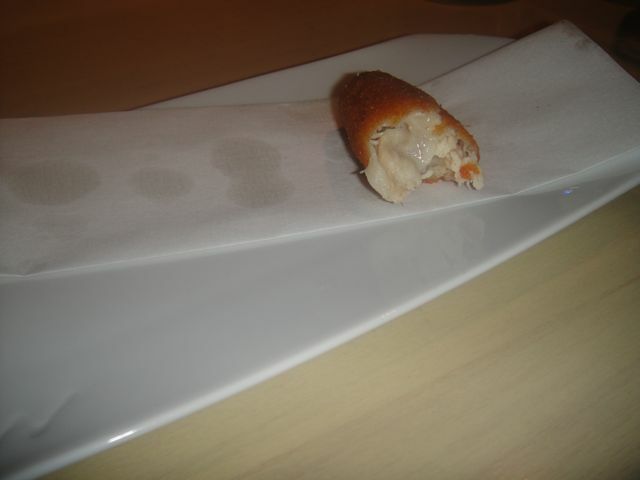 Bagel and Lox Cone” – a cone made out of brik filled with salmon eggs, crème fraîche and topped with a sprig of dill – a one bite of deliciousness. Fresh Kumamoto oysters, lemon, black pepper – presented in a tin. The tin is just for show as the oysters were freshly shucked. Jamon Iberico de bellota Fermin – acorn-fed, free-range Iberico ham – Absolutely had to have this again and just as delicious as the first time. 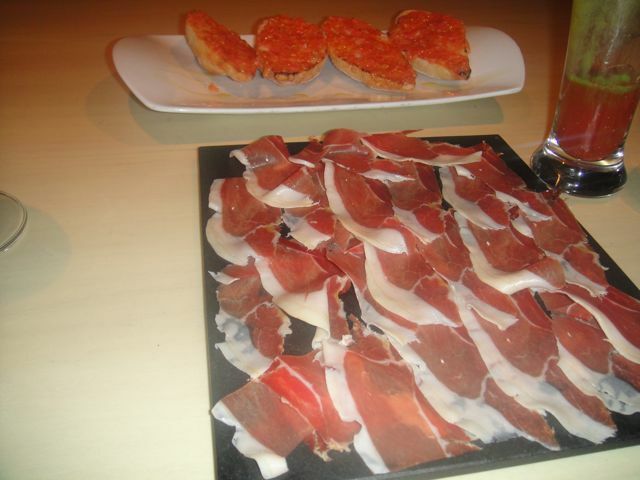 The jamon is served with Catalan style toasted bread with tomato; eat the jamon and bread with tomato separately. 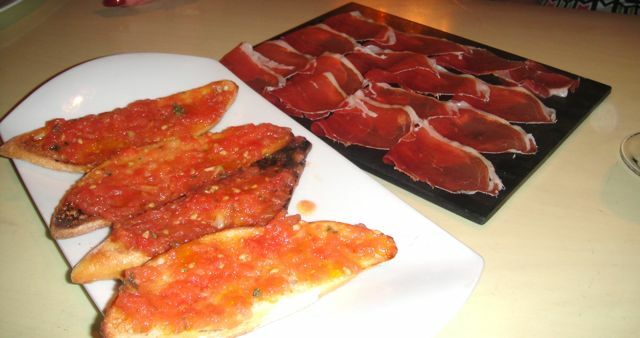 The bread with tomato was perfect as well as the jamon. 12 Tiny Eggs Sunny side up – Huevos a la Cubana “Andy Garcia” – a crispy rice cake was topped with 12 fried quail eggs, crispy shavings of Jamon Serrano, dabs of an intense, spicy tomato puree, crispy bacon and topped with some diced chives. 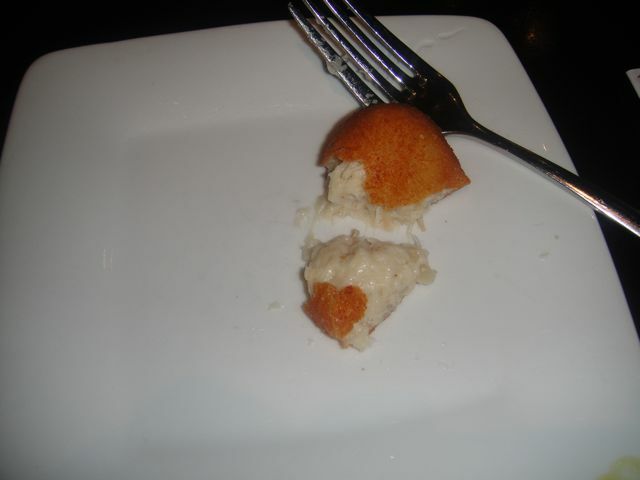 I love this dish, I love this dish, I love this dish. 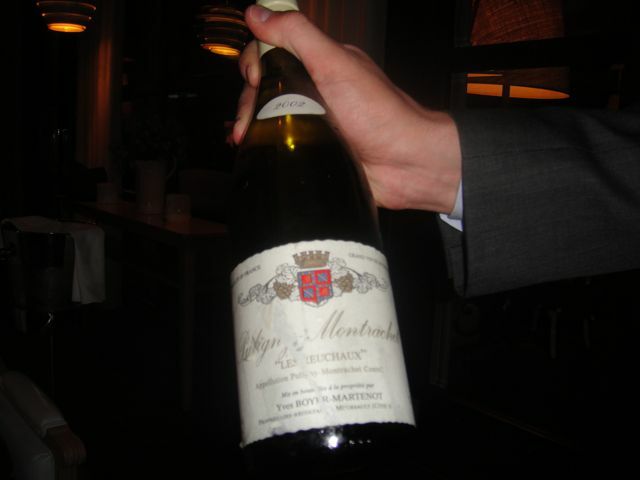 Chef Yancy Windsperger – this goes into the record books as the world of wine and food is a very small one. 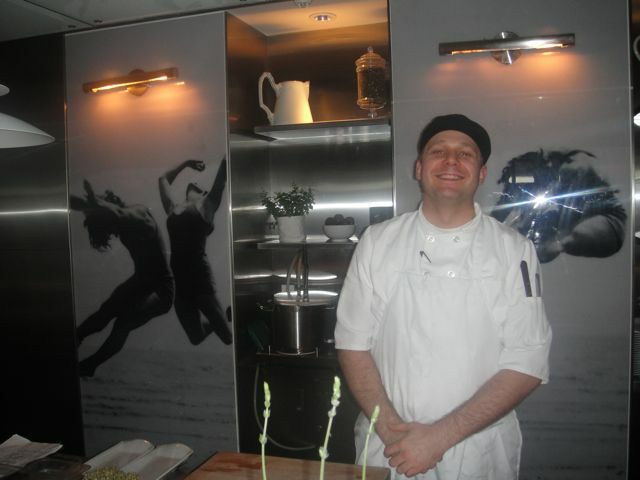 Yancy worked at Cotes Basque in New York, then Bayona in New Orleans, a restaurant in Miami and finally found his way to Los Angeles. Well, Ron and Regina Keever co-owners of Bayona witth Susan Spicer are two of our closest friends! 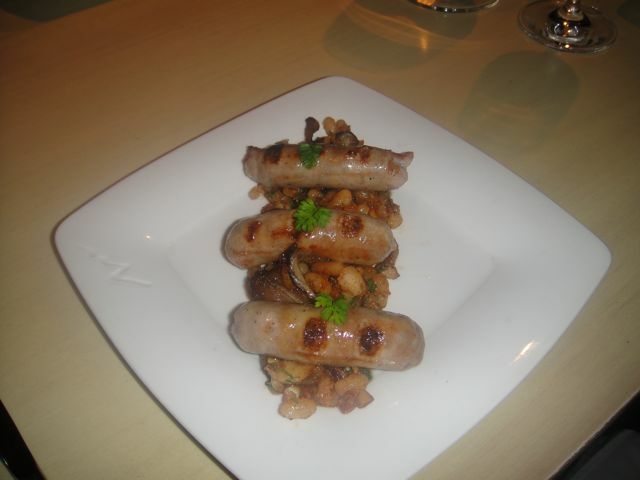 Butifarra Senator Moynihan – Catalan pork sausage, white beans, mushrooms – this time my husband remembered to take the picture. I will greatly miss the brunch at Bazaar, but there is always dinner and just maybe they will put Huevos a la Cubana “Andy Garcia” on the dinner menu. I have said this before and I will say it again that I love Bazaar for Sunday brunch. Joey told us that the night before they had done over 500 covers for dinner, Saturday night. Brunch, on the other hand is calm, civilized with good food and if you have great company, a perfect place. With Sybil and Simon, we had great company and with Ryan and Joey, we had great service. Since this was Sybil’s and Simon’s first time at Bazaar, we had many repeat dishes. 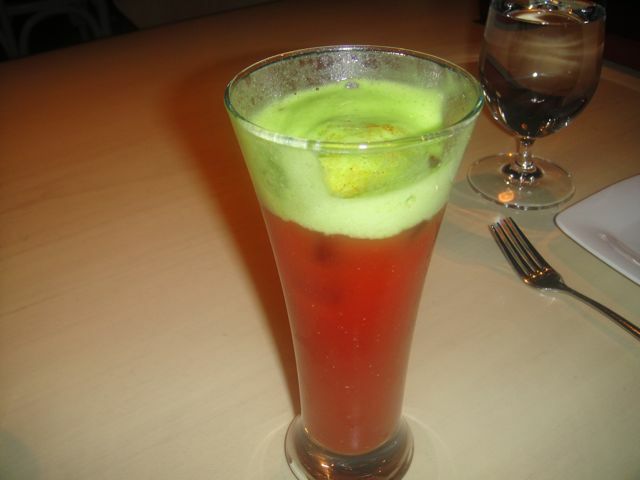 Bloody Mary – “Freshly-made tomato juice, celery-wasabi foam” – The base is a mix of tomato juice, vodka, Worcestershire, lime juice, salt and pepper. 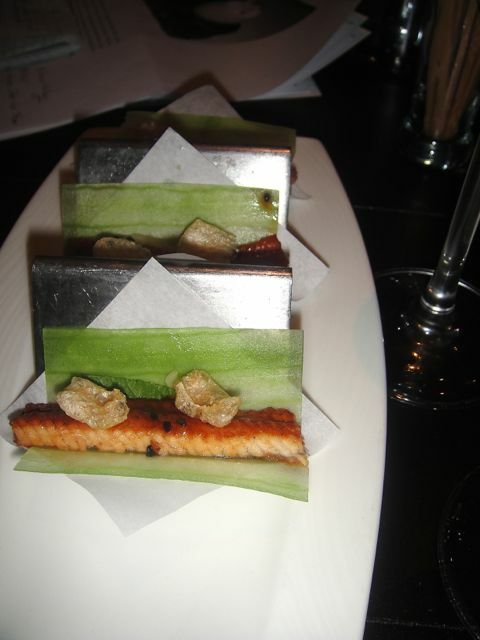 It is topped with celery-wasabi foam that is created by loading wasabi-infused lime juice and celery puree into a CO2 canister. White Asparagus, Greek Yogurt, Creme Fraiche topped with Black Olive Powder served in a tin as a nod to the Spanish tradition of canning, although the ingredients were fresh and not canned. 12 Tiny Eggs Sunny side up – Huevos a la Cubana “Andy Garcia” – a crispy rice cake was topped with 12 fried quail eggs, crispy shavings of Jamon Serrano, dabs of an intense, spicy tomato puree, crispy bacon and topped with some diced chives. This is just a must order dish. 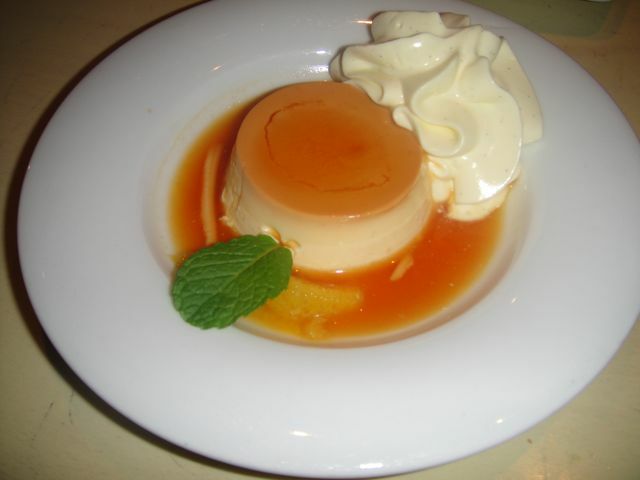 I could go to Bazaar and just order this, but obviously I never do just that! 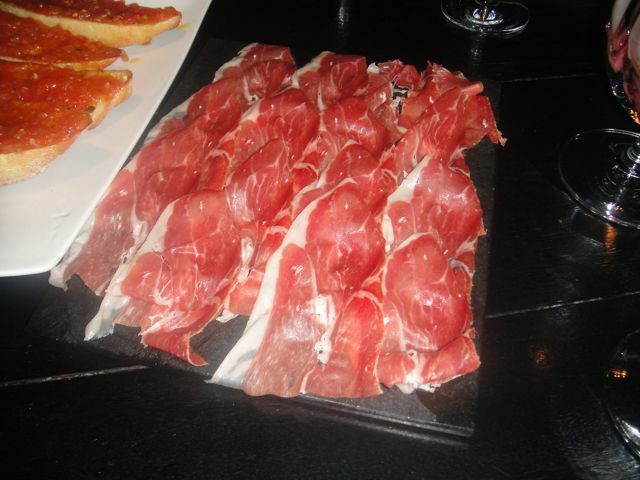 Jamon Iberico de bellota Fermin – acorn-fed, free-range Iberico ham – one of the advantages of dining with Simon is his extensive knowledge of Spanish ingredients and tapas. 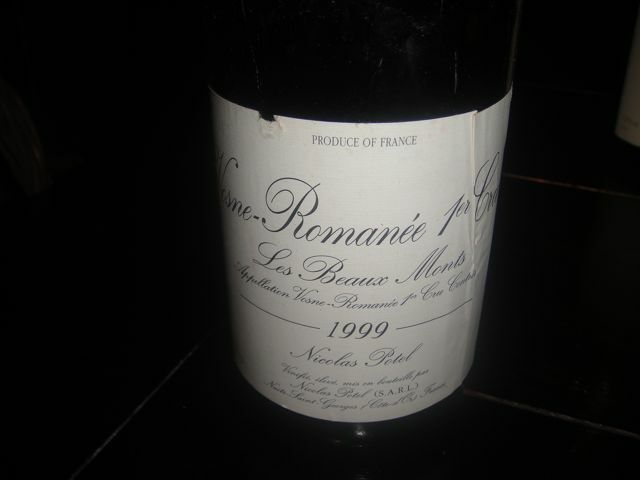 Never in a million years did I expect this to be as good as it was. 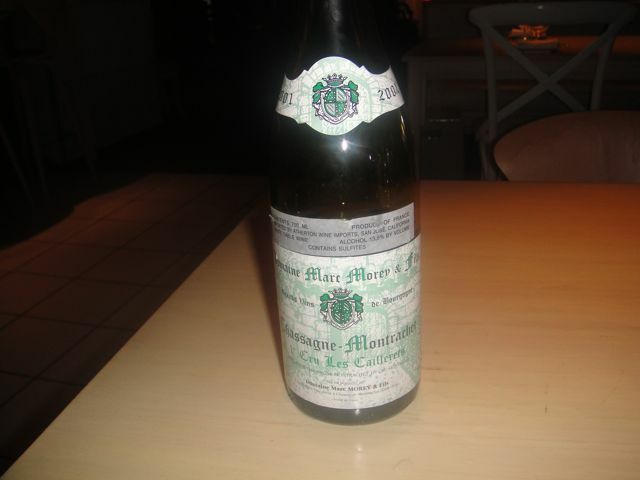 The fat is an experience in itself and has a definite acorn taste. Another gorgeous picture of the Jamon Iberico. 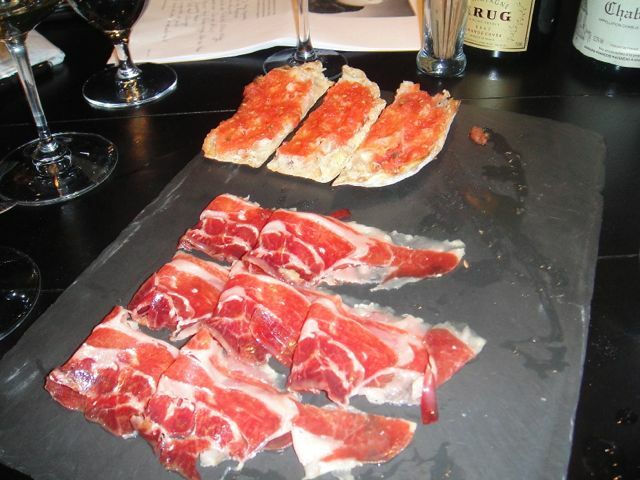 The jamon is served with Catalan style toasted bread with tomato; eat the jamon and bread with tomato separately. Tableside “Nitro” Blood Orange Screwdriver: Frozen liquid nitrogen blood orange and vodka – Ryan doing his magic. Finished Screwdriver – this basically functioned as a palate cleanser. 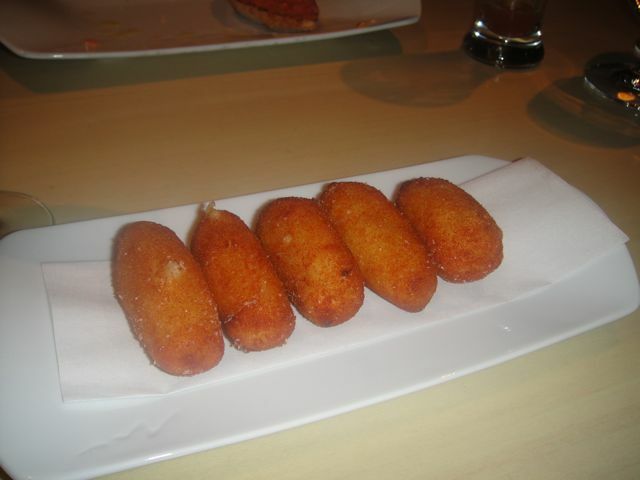 Croquetas de pollo- chicken and bechamel fritters – Simon said that the mark of a good Spanish tapas restaurant is how well they do the croquetas – he declared these excellent. Eggs Benedict “New Way”, Serrano Ham, Tarragon, Toasted Brioche – The eggs are poached in a cryovac machine at 63 degrees for about 40 minutes. Some of the ham slices were crispy and some were thin slices of room temperature ham. This time the eggs were definitely warm enough, but the whites are just not firm enough done this way. This is the only dish that misses the mark for me. 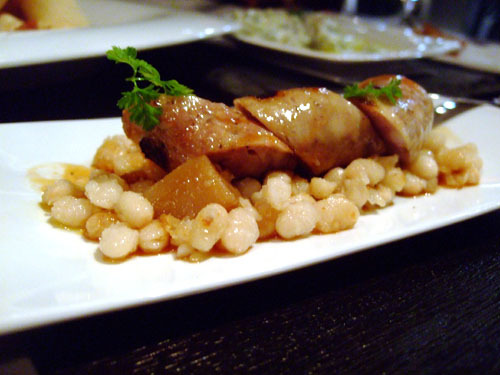 Butifarra Senator Moynihan – Catalan pork sausage, white beans, mushrooms – Thanks to kevinEats, this is his photo of the dish as my husband forgot to take a picture – Unfortunately I was getting very full and only had a small bite of this, but there is always a next time! Mojito with mint, rum and lime with the cotton candy functioning as the sweetening agent. 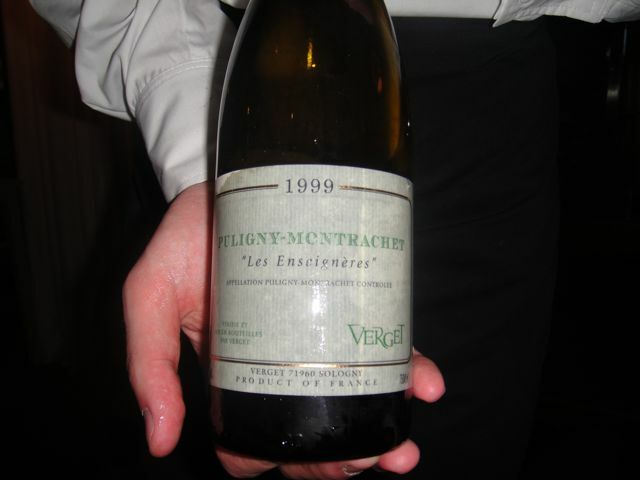 This was a 4 1/2 hour brunch and the time flew by – spectacular in all respects. 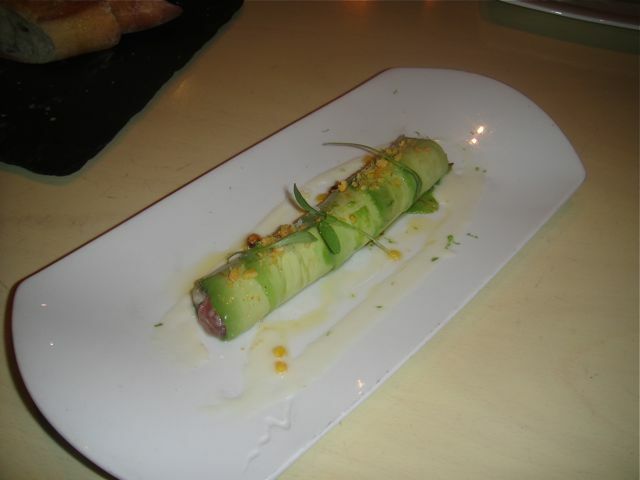 Jose Andres’s Bazaar at Brunch is one of my favorite restaurants. 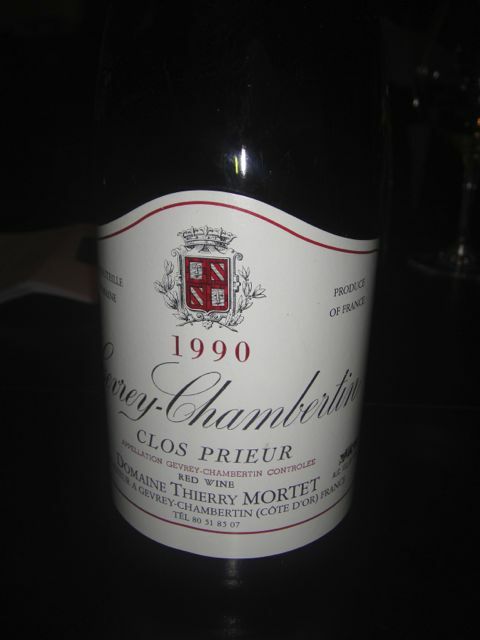 It is fun, innovative and the food is very, very good. Service is exceptional; Joey takes very good care of us and Ryan is the best server. Bloody Mary – the base is a mix of tomato juice, vodka, Worcestershire, lime juice, salt and pepper. 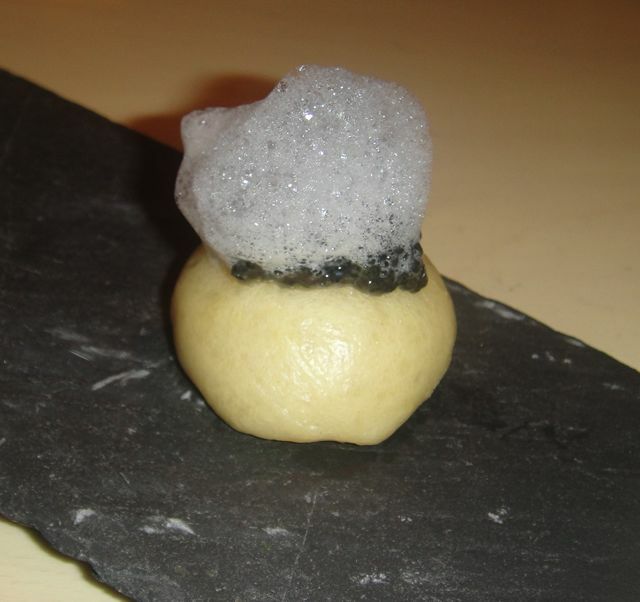 It is topped with celery-wasabi foam that is created by loading wasabi-infused lime juice and celery puree into a CO2 canister. 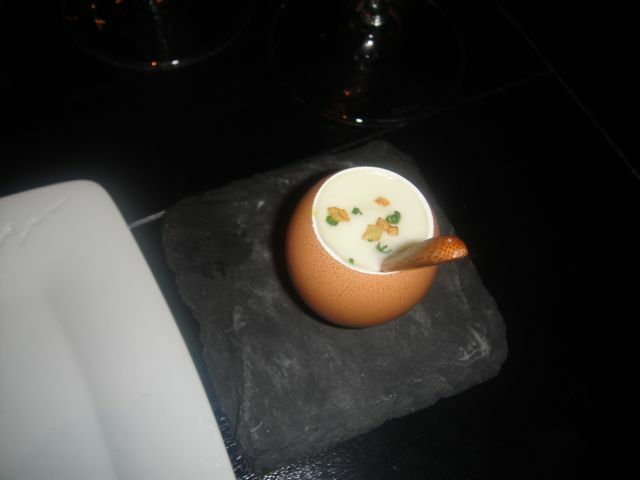 Tortilla de Patatas “New Way” – warm potato foam, caramelized onion with a slow cooked egg 63 and topped with chives – excellent and perfect when you mix the runny yolk with the potato foam. Ryan explained that the egg was cut with a laser. The closest utensil I could find on the web is the ultra carver. I use the Japanese egg cutter discovered by Michel Richard. I intend to “steal” Bazaar’s presentation and will look for slate. I have the glue gun! 12 Tiny Eggs Sunny side up – Huevos a la Cubana “Andy Garcia” – a crispy rice cake was topped with 12 fried quail eggs, crispy shavings of Jamon Serrano, dabs of an intense, spicy tomato puree and topped with some diced chives. 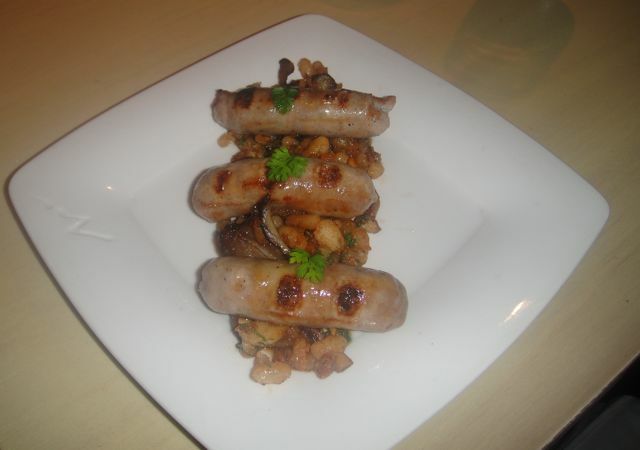 I love this dish – the combination of flavors is perfect. I explained the reference to Andy Garcia on an earlier post but I will repeat it here. Fresh Kumamoto oysters, lemon, black pepper – presented in a tin. 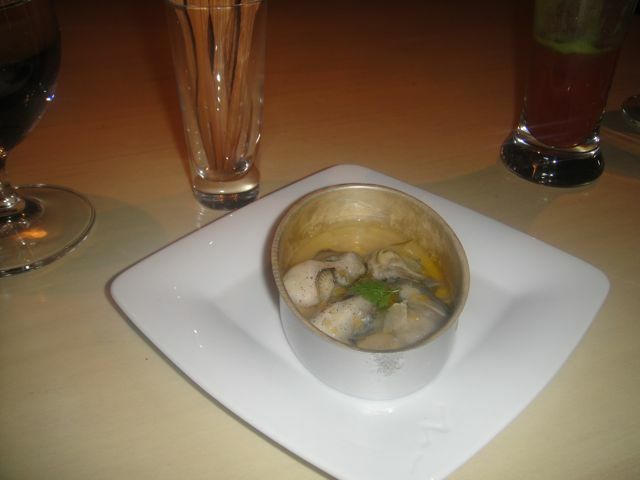 Absolutely do not think canned food – the oysters were fresh and briny. White Asparagus, Greek Yogurt, Creme Fraiche topped with Black Olive Powder – this functioned as a light transitional course – almost like a palate cleanser. Eggs Benedict “New Way”, Serrano Ham, Tarragon, Toasted Brioche – The eggs are poached in a cryovac machine at 63 degrees for about 40 minutes. Some of the ham slices were crispy and some were thin slices of room temperature ham. The eggs were just not warm enough. 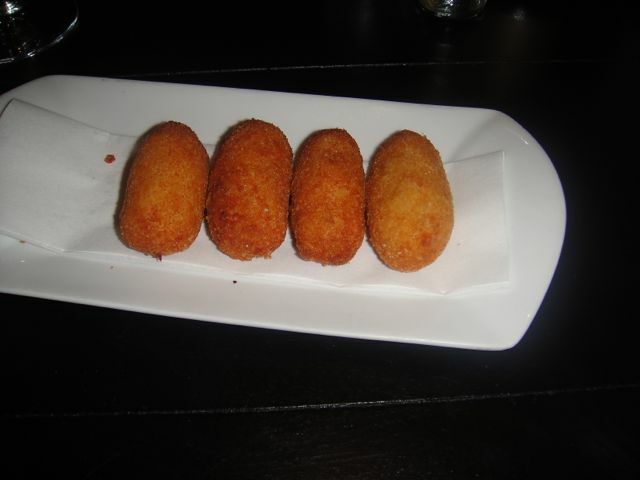 There are 2 tapas bars, each with their own kitchen. 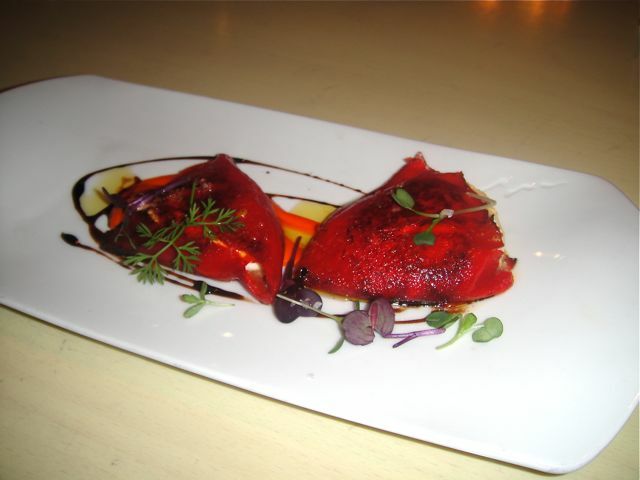 At brunch, they use the Rojo kitchen, although you are sitting in the Blanca space. 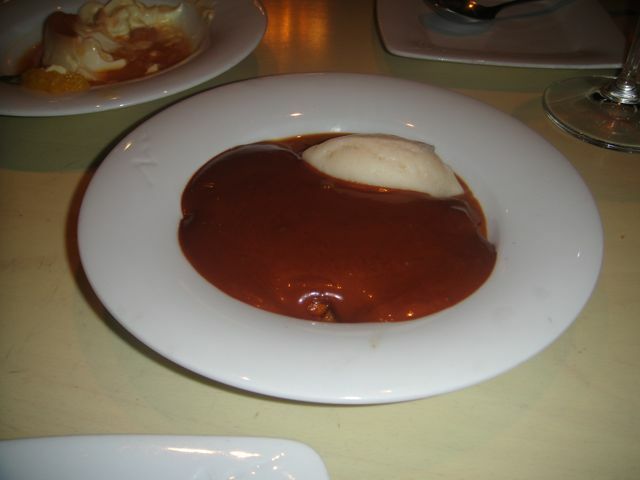 My guess is that the distance from Rojo to Blanca makes it very difficult to serve “warm” eggs. Mojito with mint, rum and lime with the cotton candy functioning as the sweetening agent. Ryan threw this in for fun. 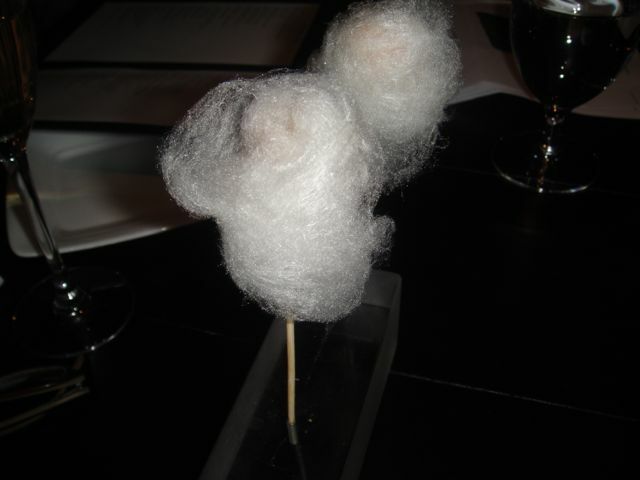 Unfortunately they don’t serve the foie gras cotton candy at brunch so he added a cotton candy drink. Philly Cheesesteak- air bread filled with oozing cheddar cheese and topped with Wagyu Beef – our friends were in heaven with this dish so was I. What a wonderful brunch with exceptional company. A weird chance of fate had us sitting next to Matthew and Christine at Ludobites. A number of emails later and we arranged to meet at Bazaar for brunch. 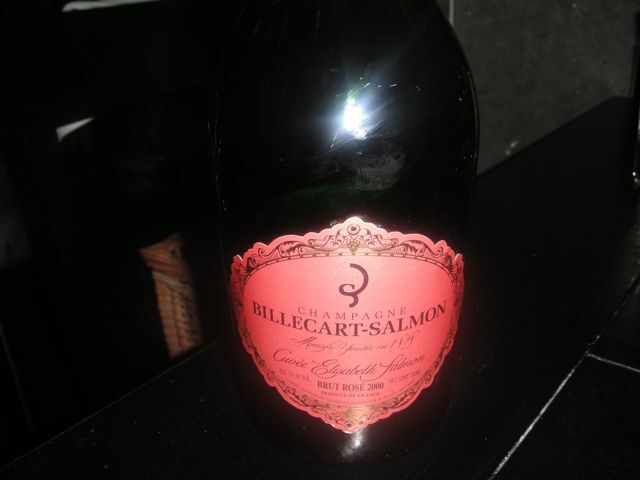 My husband had to work, but he generously donated a Dagueneau Silex, one of our favorites, for the occasion. Meeting and talking with Matthew and Christine was a real treat. However, I think I talked way too much and I do apologize to them for that. I ended up doing the ordering and decided to focus on those dishes that I knew were superior and more brunch oriented. 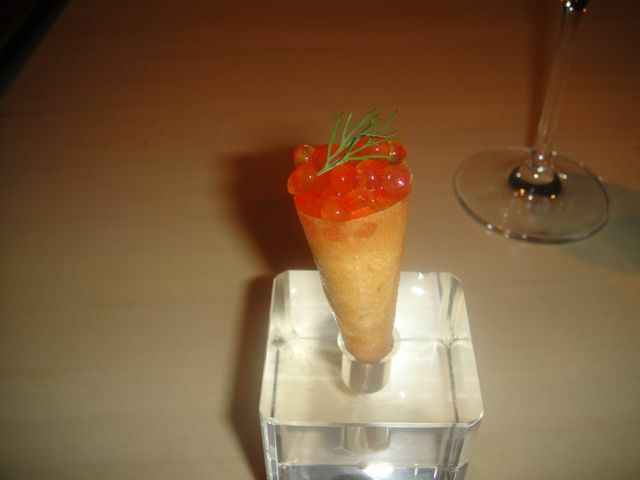 Bagel and Lox Cone – actually a salmon cone with creme fraiche and salmon eggs. 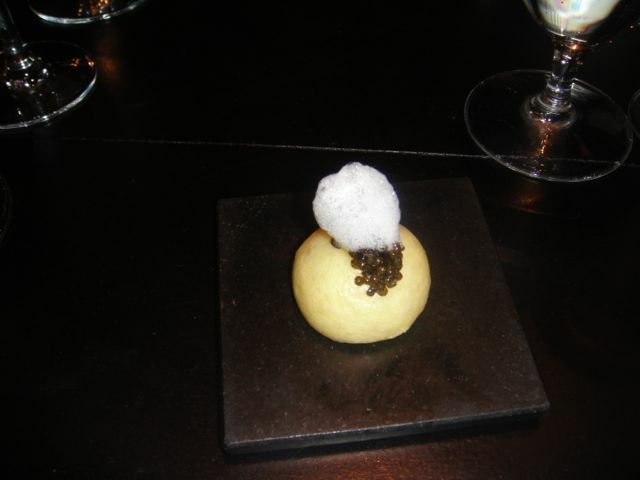 This was much better than the caviar cone served at dinner. 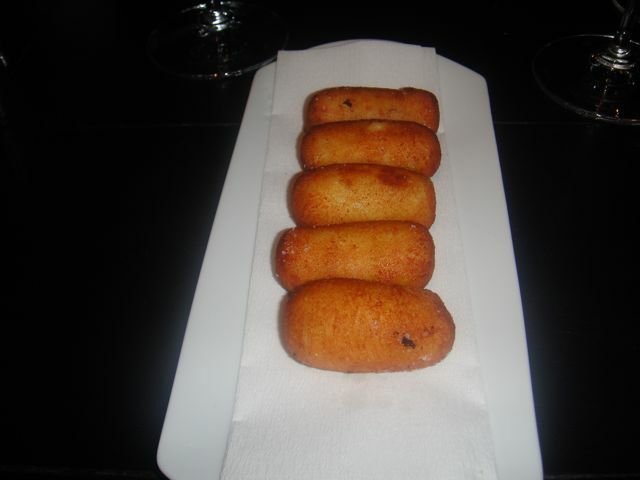 Savory Spanish Torrijas, Iberico Ham, egg 63, Idiazabal Cheese – I think this was Christine’s favorite. 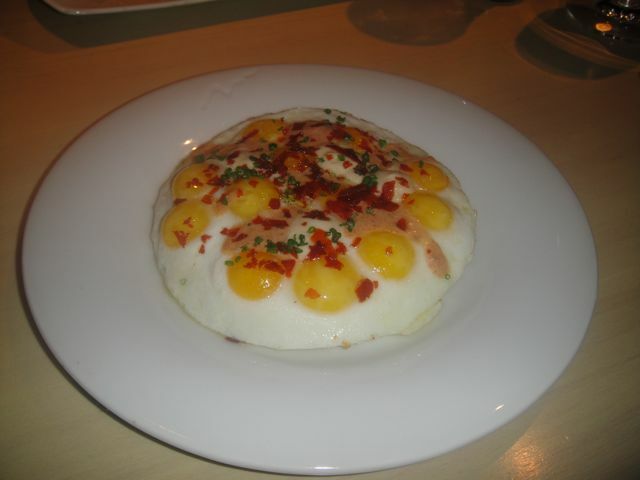 12 Tiny Eggs Sunny Side Up – Huevos a la Cubana “Andy Garcia” – I love this dish. “Philly Cheescake” – I really could have eaten 3 more of these – delicious. We were under a time constraint and probably could have ordered a lot more, but it was a wonderful time and Matthew and Christine are an exceptional couple and wonderful company.